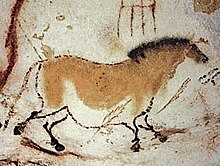 Image of a horse from the Lascaux caves. It's a tour of the gay art history of the Vatican, so it's telling the backstory of a lot of the artists who did happen to be gay and talking a little bit about the eroticism of the art, which is very prevalent and very obvious but left out in the typical, kind of staid and, let's be honest, boring standard Vatican tour. Harold Rosenberg Art on the Edge, (1975) p. 71, "Lester Johnson's Abstract Men"
One cannot, however, avoid saying a few words about individuals who lay down the law to art in the name of art history. Art criticism today is beset by art historians turned inside out to function as prophets of so-called inevitable trends. A determinism similar to that projected into the evolution of past styles is clamped upon art in the making. In this parody of art history, value judgments are deduced from a presumed logic of development, and an ultimatum is issued to artists either to accommodate themselves to these values or be banned from the art of the future. Harold Rosenberg Art on the Edge, (1975) p. 147, "Criticism and Its Premises"
The new attitude of the critic toward the artist has been rationalized for me by a leading European art historian who is also an influential critic of current art. It is based on a theory of division of labor in making art history. The historian, he contends, knows art history and, in fact, creates it; the artist knows only how to do things. Left to himself, the artist is almost certain to do the wrong thing — to deviate from the line of art history and thus to plunge into oblivion. The critic's role is to steer him in the proper direction and advise changes in his technique and subject matter that will coordinate his efforts with the forces of development. Better still, critics should formulate historically valid projects for artists to carry out. That not all critics have the same expectations of the future of art does not, I realize, weaken the cogency of my colleague's argument. The surviving artist would be one who has been lucky enough to pick the winning critic. My own view that art should be left to artists seemed to my mentor both out-of-date and irresponsible. Harold Rosenberg Art on the Edge, (1975) p. 147, "Criticism and Its Premises" p. 249, "Thoughts in Off-Season"
I guess a school of thought would be you don’t have to see anything of the past to express yourself artistically, to write a novel or to write a play or to make films but I think if you make it available, I think one studies or one becomes aware of the older work that came before. Of the older masters - easy if you want to reject it, which is part of the process, to be angry to say “That’s impossible, it’s no good at all look at this, this is wonderful here.” And then come back to realizing maybe I’m a little too harsh twenty years later or thirty years later, I’m a little too harsh on certain people when I was younger. But I do think it’s important to make younger people aware of what came before in every aspect of every art form. And it’s exciting too, and as you do that very often if you’re working with young people and working with students. I use mentoring, the idea is you do get a lot out of it. I do get a kind of regeneration of that, to see that excitement sometimes, to show, let’s say The Magic Box or Yojimbo - it’s part of being alive. This page was last edited on 21 February 2018, at 07:22.